Racism in America is a big problem. Bigger than it should be. Racism has been a problem forever. Its okay to not like a person but you shouldn’t not like a whole race, or make fun of a whole race. What makes you feel that way to where you don’t like a whole race? Is it stereotype? Is it because one person of that race did something bad now you don’t like anyone in that race? Is it because you saw something in a movie or TV show? To fix this people just need to be less judgmental, and accept people for who they are. I believe that racism is a big problem in our world but it can be fixed. Others may say that there are more police in a poorer neighborhood because the crime rates are higher, not because a certain race lives there. At the bottom of the paper, you can see a table that compares men in prison by three different races . 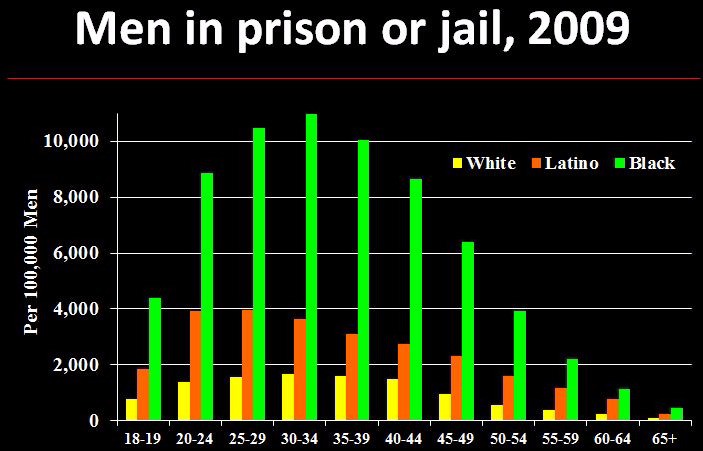 White, African American and Latino and as you can see African American has the most people in Jail or Prison. Not because of their skin color, but because they commit the most crime. If everyone in our world got along for the most part, our lives would be different. If people are not racist our world would be different. 20% of every 100 million people are affected by racism (TeenInk.com). That is a lot of people affected by racism. Imagine if it was only half of that. That would still be 10 million which is still a lot of people affected by racism. Racism has gotten worse due to social media. People will post bad stuff about a race or religion and everyone will believe it. That’s just how this world is, many people believe what they see on social media, not everyone though. If you go onto social media you will eventually find something that has to do with racism. I believe that some people are racist towards a race just because of a movie or TV show. For example, in the movie "Lifted" A Muslim lady shoots the dad, now people will think Muslim people are bad and might shoot you even though that was just a movie. People who get made fun of because of their race are affected in many ways. They may not trust anyone except for their family. They may experience sadness, anger, depression, headaches, fear, trembling, muscle tension and increased heart rate. Because of this it can reduce people’s ability to study or work and to achieve their future goals. I think the next step in making racism less of a problem is to get people to realize no matter the race we are all different compared to one another but one race to another race is not different. Even if you are different race at the end of the day everyone is human so we are the same. There could be two possible outcomes one everyone for the most part will get along, or people will not get along and racism will become worse. I can conclude racism is a big problem in the world today and needs to be fixed. If racism on the internet and in movies wasn’t as bad, that would be a start. If everyone realized we are all human, racism could become less of a problem. I think that the government should allow immigrants into our country only under certain circumstances. This letter talks about racism and what we can do to end it together to re-unite America as one people again. We need to sit down and have a discussion about B.L.M.